Do you like board games and cards games? 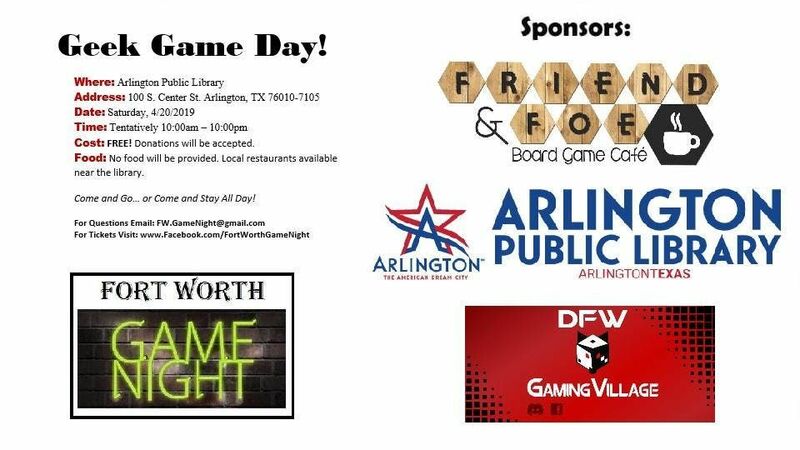 Come play board games at Arlington Public Library on Saturday April 20, 2019 from 10am to 10pm! • Get your free ticket through EventBrite! Each participant will need a ticket. This includes minors or those under thage of 18. • Cost to attend is FREE! We will be accepting donations to go towards the costs associated with this event and future Geek Game Days. • There will be no food or drinks provided at this event. However, you are welcome to try out one of the local restaurants in the area. • There will be some games available at this event. However, feel free to bring your own games too! • At this time, there will only be 200 tickets for this event! Get yours today! • Please print off your ticket or provide the digital copy of your ticket at the door. A badge or bracelet will be provided for this event. 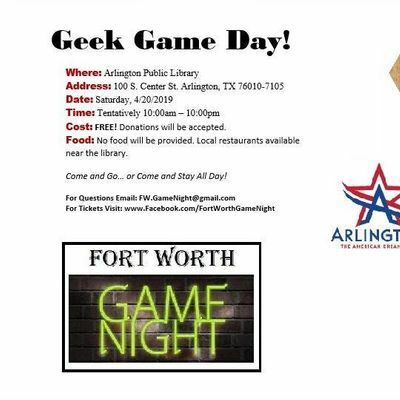 • Sponsors for this event include the Arlington Public Library, Fort Worth Game Night, DFW Gaming Village, and Friend & Foe Board Game Cafe. • Last time our Geek Game Day sponsors included: Arcane Wonders, Blue Orange Games, CheapAss Games, Czech Games, Daily Magic Games, Garphill Games, Level 99 Games, Mantic Games, Roxley Game Laboratory, and Thunderworks Games who are contributed games to this event. We gave away over 30 games! • Games played at past events included Scythe, Blood Rage, Century: Gollum edition, Unearth, Bunny Kingdom, Ethnos, Arctic Scavengers, Cosmic Encounters, Concordia, Coup, Rise of Tribes, Dead of Winter, Deception, Dice Throne, Arctic Scavengers, Lords of Waterdeep, Rising Sun, Clank!, Eclipse, Champions of Midgard, Dinosaur Island, Root, and Explorers of the North Sea. There are no ID or minimum age requirements. However, minors or those under 18 will need to be accompanied by an adult at all times. Staff will not be responsible for children. You can bring games, drinks, and snacks. Please make sure to eat your food or drink your drinks in the designated areas. No alcoholic beverages allowed. No you do not. You can present a digital copy of your ticket at the registrarion area. 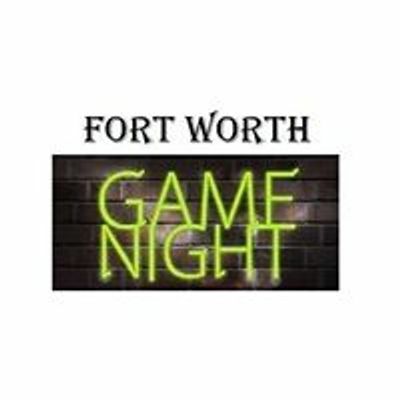 Email us at RlcgISBHYW1lTmlnaHQgfCBHbWFpbCAhIGNvbQ==, send a message at www.facebook.com/FortWorthGameNight/ or private message Jonathan Key on Facebook.